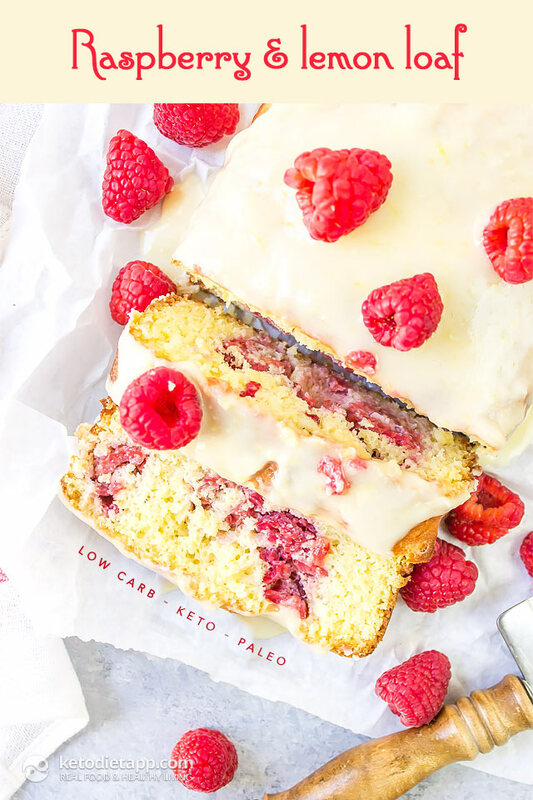 This Keto Raspberry Lemon Loaf is one delicious low-carb dessert. And if you like to enjoy a slice of coffee cake for breakfast, this easy cake might be just what you are looking for. The lemon raspberry combo can’t be beat in any dessert recipe, although you can other berries, too. Blackberries, blueberries or strawberries are all keto-friendly and will work just fine. 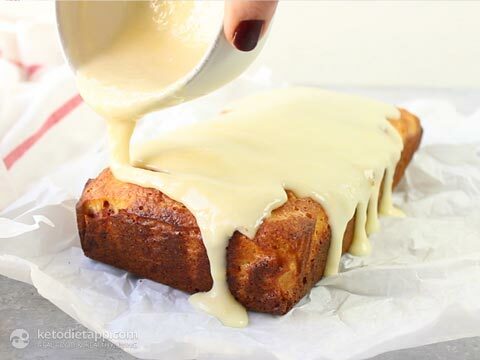 Don’t skip the glaze, even if you make the sweetener-free option, it may just be the best part! 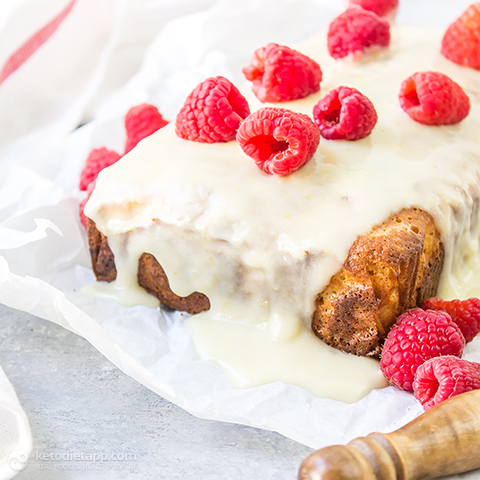 Note: The glaze is very sweet and may be too sweet for those who are used to low-carb eating. Alternatively, you can use the glaze in our Low-Carb Lemon Cake which is made with melted coconut butter, coconut oil, lemon juice and lemon zest (sweetener can be skipped or used to taste). Preheat oven to 175 °C/ 350 °F and line a loaf pan with parchment paper. 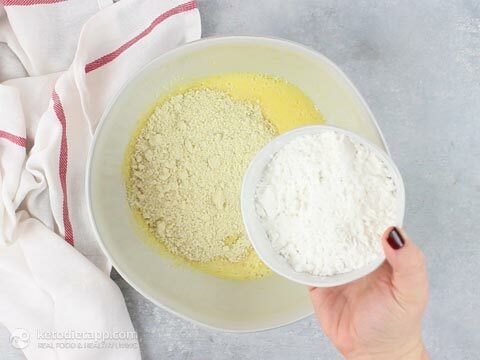 In a large bowl whisk together the dry cake ingredients. 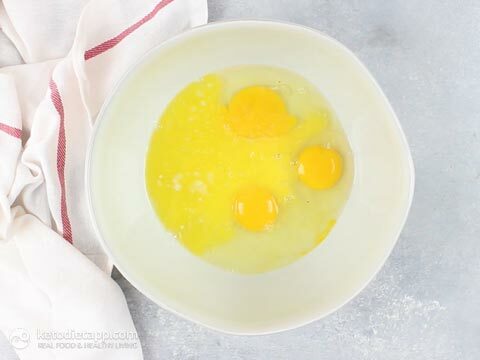 In another bowl, beat the eggs using a hand mixer. Add the melted butter (or ghee), lemon juice, and lemon zest. Add the dry ingredients. 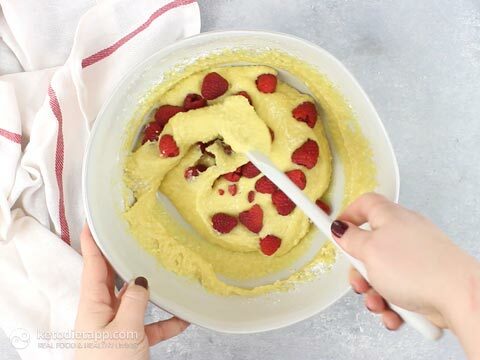 Gently fold in the raspberries and mix using a spatula. 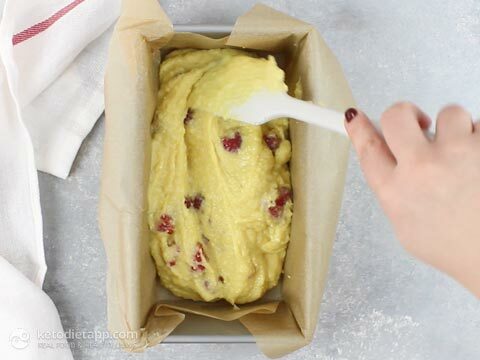 Pour into the loaf pan lined with parchment paper and spread evenly using a spatula. Bake for 1 hour or until a toothpick inserted into the center comes out clean. Once cooked, remove from the oven, set aside and let cool before adding the glaze. 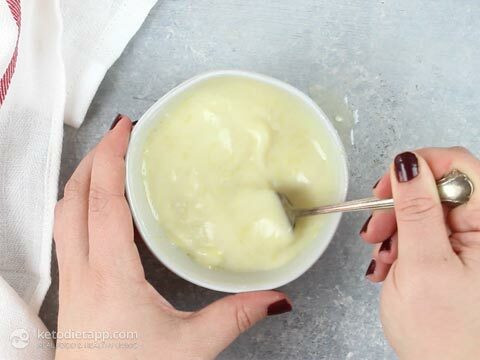 To make the glaze simply mix together the ingredients in a small bowl until smooth. (See tips above for sweetener-free option). Pour over the cooled loaf. Sprinkle with the reserved raspberries. Slice and serve! Store covered in the refrigerator for up to 5 days. Delicious. I substituted the butter with unsweetened apple sauce. Will add to my favorites. I am going to try with cranberries and orange in a couple weeks. There's a big part of the instructions missing. Do you add the dry ingredients to the eggs? I guess so, based on the pictures, so that's what I'm going to do, but I hope it turns out okay. 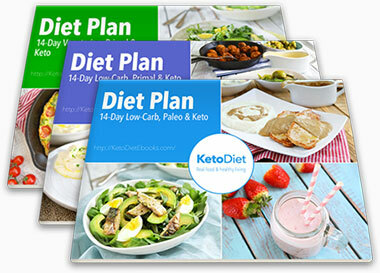 Hi Sherie, there's a video recipe that shows how to make this step-by step. I hope this helps! Omg! 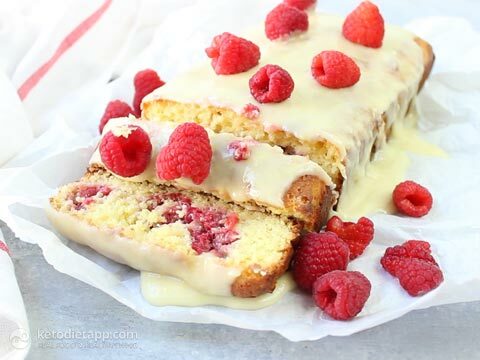 The combination of lemon and raspberries are amazing. I just couldn’t get the glaze to thicken. It was just sweet lemon juice. Pointers for next go around?? Hi Alice, maybe the lemon was too big?  If it's too thin then you'll need to add more powdered sweetener, or use a tablespoon less lemon juice. I hope this helps! Would it be possible to use another sweetener? I made this yesterday for my husband...well it didn't make it to the icing stage. He says it is the most incredible thing he has ever tasted! I did manage to steal a small piece and it was so good! Will make it again and this time double the batch! He really wanted you to know how "freaking awesome" this is. Thank you for the recipe! I made this with blackberries & cut the swerve by 33%. Delicious! I didn't even make the glaze as my palate no longer likes too sweet. 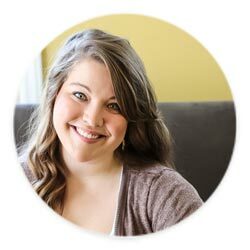 Thank you for the feedback Sheri! I am the same when it comes to the sweetness,I would skip the glaze or use melted coconut butter. Is it best to use fresh raspberries or would frozen be ok too? I think you can. Sometimes when you defrost berries, there is too much water. The best way would be to let them defrost and only use the fruit (not the juice/water if there is any). That's a tough one! I haven't tried using anything else and most cakes I've made use eggs. I assume it won't be as fluffy but it should be possible to use "flax eggs" or "chia eggs". Maybe someone else can advice?